Left Kelly Cates behind ahead of coverage of Liverpool's 3-1 win at Southampton. 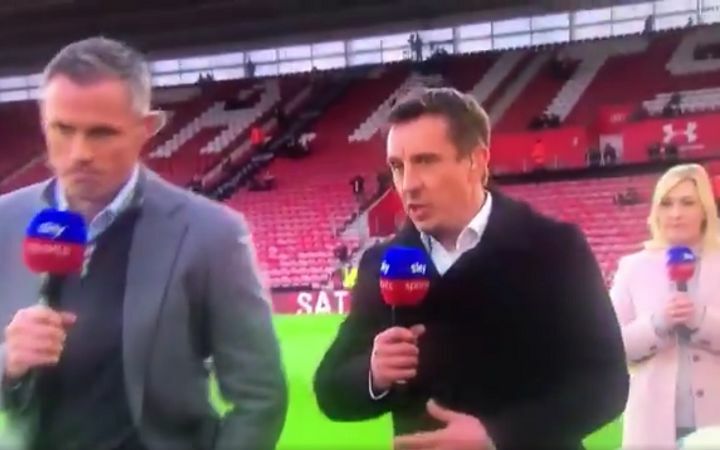 Gary Neville and Jamie Carragher bizarrely began to walk away from presenter Kelly Cates as soon as they started answering her question ahead of Southampton vs Liverpool on Friday night. Involved with Sky Sports’ live coverage of the Premier League clash, the former players turned pundits were speaking pitchside at St Mary’s before kick off. In conversation with presenter Kelly Cates, the pair suddenly turned their back on her as they responded to her final point. Neville and Carragher were heading off to get a few words with Southampton manager Ralph Hasenhüttl but didn’t hang around and left Cates behind, looking rather forlorn.